Chelsea's Starting XI vs Bayern, From a Fan's Point of View. 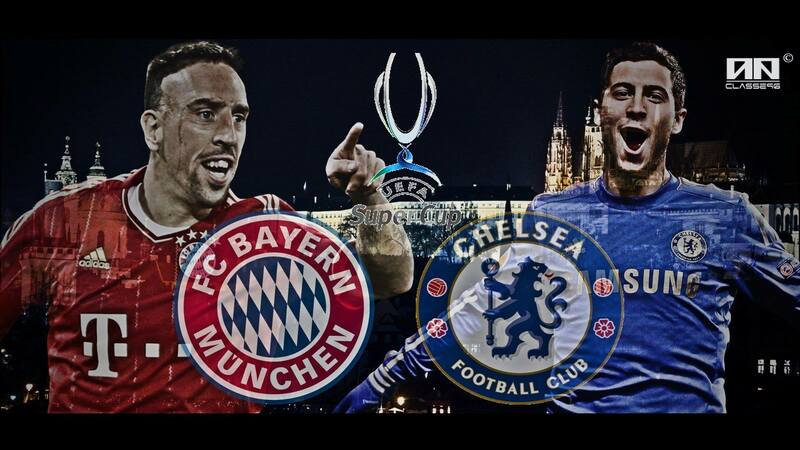 Chelsea vs Bayern Munich, Round 2. Or is it a chance for Bayern to gain revenge on Chelsea? Or maybe another chance for Pep Guardiola to lock horns with Mourinho, and engage in a fierce battle? Or maybe both teams want to showcase their talent to the big boys of Europe, and give them a taster of what’s to come in this year’s European and Domestic competitions. One thing’s certain, this will be no walk in the park for either team. An obvious choice, as he’s been for a decade, Petr Cech, one of Chelsea’s heroes in our 2011/12 triumph, is an automatic starter for this game. He’s fit and raring to go, and his experience will count for a lot when dealing with dangerous situations such as set pieces. His distribution will have to be perfect as ever, allowing our attack to create something against a very solid Bayern defence. He’s only conceded one goal in 3 games so far, and he’ll be aiming to keep another clean sheet. Well in my opinion it should be Azpi because he is more nimble and agile, could help with dealing against the pace of Gotze/Shaqiri. He should be allowed to but Mourinho will prioritise defence in this game, so I don’t expect him to bomb on forward. Has looked extremely solid alongside John Terry. The duo have always seemed to have a good understanding between them, and Monday night proved that Cahill is still more than comfortable playing big games, as he has done in the past. He will have quite a lot on his plate, having to deal with the Ribery and Gotze threat coming in from the left side. Got to be JT. Very obvious pick. Has been solid since the start of the season and won’t be involved in upcoming internationals. I think it’d be sensible to choose the starting XI around the internationals due to fitness of some players. He’s José’s mouthpiece on the pitch and probably still one of the first names to go down on the team sheet. JT is still showing why he’s one of the best. Cole for me without a doubt, showed how good he still is with a string of backtracks and important blocks in the game against United. He’s better than Bertrand even when attacking. Plays on the wings with Hazard, who seems fluid when Cole plays! Robben always looks forward to the defender making a challenge and failing at it. Generally goes past, cuts in and scores that left footer, however Cole is excellent when 1 on 1. Mourinho’s confirmed that he’s trained and marked fit for the game. In my opinion, he could be Chelsea’s most vital player on the pitch tonight, if selected. I personally don’t see Bayern letting us go through them and giving us much of a chance to attack, which is why David Luiz’s quick passing and switching of play will come in handy when we’re on the break. Defensively, we know how good he is when he sits back in midfield. With Ramires alongside him, they can share the defensive work, but if fully fit, Luiz would prove to be the difference against a team that are known for breaking down midfields and defences with supreme passing, and instead counter this by having Luiz cover our back 4 making interceptions and diffusing dangerous situations. has given him. He has averaged the most passes of any of our players so far, impressive for a player who supposedly lacks technical ability. Combine that with his pace, strength and good tackling, and I feel Ramires is one of the first names on the team sheet. Hazard – His trickery and unpredictability will cause Alaba the most problems. Cutting inside from the right will make Dante uncomfortable. Alaba likes to attack and the pace of Hazard means he can keep up and not leave Azpilicueta isolated against 2 world class players. And with Alaba attacking, it means the gap will be there in defence and with the pace of Hazard it’ll be easier to exploit. Despite being best at LW, swapping him for this game would be smart I believe as their biggest threat is through the left, and with Hazard also improving defensively, it could prove to make a big difference. Juan Mata. Because he is our best no.10 and because Oscar has been playing nonstop & it’ll send a resounding message to all. Even with the little ball possession we had in the United game, our passing was woeful. Mata is by far our best passer, he reads the game really well going forward. He is clever & is the most creative playing behind the no.9. Chelsea sorely need his experience and vision against a big side like Bayern & most importantly he has already played against Bayern in Chelsea’s most important game ever. Oscar. Bayern have one of the best RW’s in the world in Robben and Cole has lost a lot of his pace so he will need a lot of help, and Oscar will track back and we know he is a decent tackler. Oscar will also help block Lahm’s runs from RB. Lukaku should start because of his physicality, he has the pace and power to get behind Dante who is a very good defender, Torres doesn’t have the capability as he is low on confidence and Lukaku is eager and has something to prove. So that’s our preferred line-up from a fan’s perspective, do you agree with it? What would you change, and why would you change it? Will it change the dynamic of our game, in what way? Let me know in the comments section below! Mikel obi should be the one to start in the defensive midfield,he is a big match experience defensive midfielder,If u watch our UCL final,u can see his contributions there. I think we better have mikel in the Mid coz he hols it without fear en he’s evperienced en to addd to it he’s a player whod goes onto the ground for the ball from the opponent!Azpillicuetta noo where is Ivanovic or Luiz there? @ ANONYMOUS SO IF U HAPPEN TO BE MOU DATS WILL BE YOUR SELECTION TO PLAY AGAINST BAYAN M? this is not a friendly match, if JM use that, we are done for. A few years ago I’d have to pay someone for this inamtofrion. God bless your selection, but Eto is on this team now i don’t see him on the bench, he should start the game. It is a good selection and perfect formation, kudos!……i am 100% in support. that is highly agreeable. somehow, it may be good to consider lampard, even as a substitute. Mikel shouldn’t be in squad hes are worst midfielder hes to slow and only goes sideways. injustice is being served here. Victor Moses who contributed immensly to the europa cup has been dropped meaning he won’t get any medal if we win, just like Drogba who gave us the Champions league was humiliated out from Chelsea after we won the champions league by not offering him atleast 2 years contract, and we saw what happened, we got one trophy out of seven. God never sleep and hates injustice. This is an injustice to Victor Moses. Let’s watch out tonight, we are going to lose it, not just lose it, Chelsea must be disgraced. Mourinho won’t last, he hates Spanish and that is why Mata is suffering because of his stupid altitude in Spain. drogba in no way was humiliated out of chelsea ,he left us like a true legend and his final kick won us the cl,the fans love him and he loves us ,though i believe that he still has the ability to terrify and bully the defenders i doubt if he could maintain the same for a whole season or play more than a game per week,the main reason why he left us…. not a Chelsea fan just a muppet..
his name is Lee Ward, had clients stiting there with him in his office.All I needed to do was give him my credit card number so he could hold a31,399 from it just incase I delayed in sending the the documents for the new owners! !Ofcourse, I smelled a rat!! I told him I don’t use cards or cheques.He’s calling me again today to see if I’ve talked my husband into using HIS card for the transaction.i’m going to have a bit of fun with Lee Ward when he rings today! !Another name within Excalibur is Sally Hansen, she contacted me the day before Lee Ward, to see if I wanted to sell my CCConcierge, I said I did then wham! Lee’s on the phone with buyers in his office the next day.I was duped by CCConcierge into paying out a35,000 a few short years ago, money down the drain as far as I’m concerned ..it’s not going to happen a second time!!! why don’t you find a coffin to lay while we all watch the game huh? …fxcking cxnt! For the middle I will go with Mikel (strong with an excellent spreading vision of the ball and positional discipline. I have watch Chelsea this season and noone has played that defensive role better than him so far! He is very calm on the ball and can either slow down the pace or make one counter attack pass) and Lampard (if you want the best play him alongside Mikel) cos they are well experienced against pep and this bayern side! Ramires (great tackler and could get you goals but not the best of passers and not much of a technical player) can come on for Lampard in the second half. Oscar can start from the right side forward, Hazard on the left side forward and put Mata(great vision for spreading balls and best crosser of the Chelsea team! Roms and switch flanks as well as ready to lash on rebounds!) right behind the striker. Romelu Lukaku should strike cos he’s strong and knows how to holdon for teamates to join attack! He’s high on confidence too and want to believe Jose kept him for this game and that’s why has not really started any game. excellent spreading vision$ your having a laugh. mikel is r worst midfielder, jose knows this garranty mikel will not start. the only thing mikel can spread is butter. his average pass is 2 metres sideways and hes r slowest player. bet terry could bet him in a race. mikel has only had 2 sub app in the league, and 50mins pre season and at no point was he r best midfielder. and you recon you’ve watch Chelsea. where in a cave. my taxi is running mikel just give the word and ill drive you to turkey. My wife was alled by Karen Morgan they had a client who wtaned to buy a timeshare the client would pay the fees etc no cost to us. She would phone back laterI did a search of reverse phone calls to trace 08712311241 and was directed to your site.Karen phoned back and I aksed her who she worked for Excalibur Sales and Marketing I then told her that I knew all about the company and that you are all con merchants who will be asking for transfer fees etc How did you know the name of our company she asked with a rather aggrieved voice Ah you might well ask I replied.She rang off! Mikel shouldn’t be touched with a barge pole. I see a lot of people calling out for him with little or no genuine reason. He’s ineffective to how Mourinho wants to play, he slows play up too much to be able to counter efficiently. 5 yard passes are no good when you want to break away. For those of you condemning Mikel for Ramires did you see their impact in tonights game?